You can compare two 3D models, i.e. 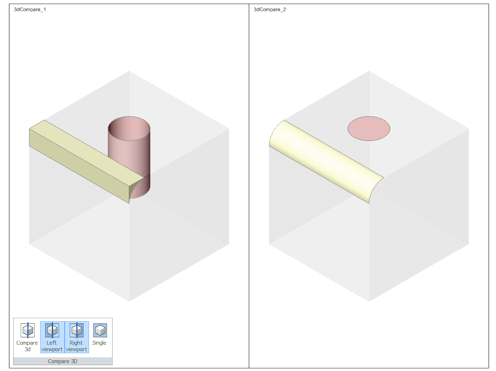 3D solids and surfaces stored in two .dwg files, including ones imported in BricsCAD from other file formats. The tool efficiently processes large models and reports differences in the Mechanical Browser. Several visualization modes are supported. A 3D model is a .dwg file with one or more 3D solids or surfaces. 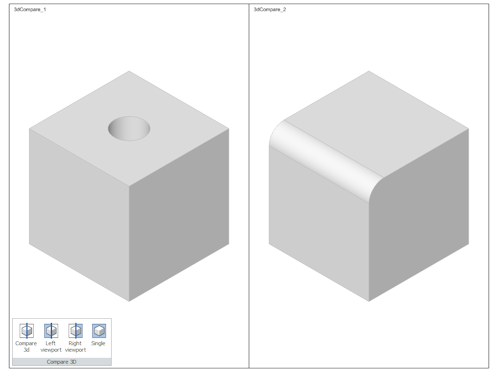 When comparing two 3D models, BricsCAD first tries to automatically align them in 3D space to obtain the maximal similarity. Then all faces of these 3D solids and surfaces are compared geometrically with a given tolerance. If for every face in the first file an equal face in the second file exists and vice versa, such models are considered as equal. However, if for a particular face in one file there is no equal face found in another file, or if only part of this face is equal to a part of a face in the other file, then a difference is detected. 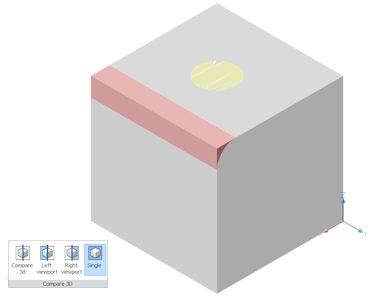 Therefore a difference is a full face or a part of a face of a 3D solid or a surface, for which there are no equal parts of full faces found in the other file. Two or more differences are grouped together if they are geometrically adjacent to each other. A difference node is created in Mechanical Browser for every group of adjacent differences. If you expand this node, you can see the particular differences it consists of. When you select the difference in the Mechanical Browser the corresponding feature highlights in the drawing. The 3DCOMPARE command creates a new .dwg document named Compare_<File_1>_<File_2>.dwg. The compared models are attached as external references to this drawing, A special layout named Comparison . in which two viewports exist, one for each of the two models. The display is controlled through the 3DCOMPAREMODE system variable. If the value of 3DCOMPAREMODE is different from 0 (zero), the corresponding model becomes semi-transparent, while the differences are displayed using different colors (each difference is painted in its individual color). Using the Mechanical Browser context menu you can zoom in on a particular difference. Click the Left Viewport ( ) and/or the Right Viewport ( ) tool button. Double click in one of the viewports, then use the mouse/keyboard shortcuts to manipulate the display (e.g. zoom in/out or rotate). The display in the other viewport is synchronized automatically, allowing to compare the same part in both models in detail. 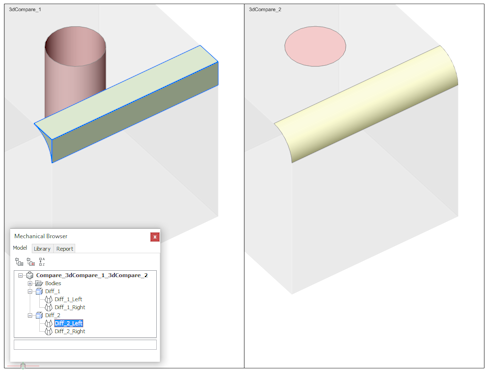 Click the Single ( ) tool button to see the differences in model space.